Kettering Town are closing in on the Evo-Stik League South Premier Division Central title after they claimed a routine 2-0 win over a young St Neots Town team at Latimer Park. The Poppies ended the day 11 points clear at the summit after Tom Knowles, who scored Kettering’s last minute winner at Stourbridge in January, did it again as he struck late on for Royston Town to give them a 3-2 success over the second-placed side. With just six games to go, Kettering now know that three more wins with guarantee them the crown. They were comfortable winners in front of 894 fans at Latimer Park as Rhys Hoenes’ penalty after a handball from Harry Beckley and Declan Towers’ far-post header put them 2-0 up in the first half. Both Dan Holman and Brett Solkhon hit the crossbar in the second period but Kettering comfortably saw things out to return to winning ways after their defeat at Biggleswade Town last time out. AFC Rushden & Diamonds dropped out of the play-off places in the Premier Division Central after they were held to a 1-1 draw at Barwell. Andy Peaks’ team missed a golden chance to open the scoring after nine minutes when they were awarded a penalty after Zack Reynolds was fouled in the area. But Ben Farrell fired the spot-kick over the crossbar. Jack Bowen saw an effort ruled out for offside early in the second half but Diamonds did take the lead on 50 minutes. Bowen nodded the ball down and Ben Diamond fired home from the edge of the area. 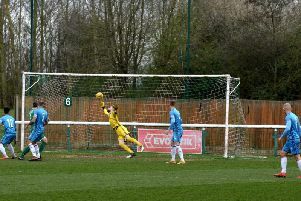 However, Barwell hit back and levelled on the hour when a ball through the middle split the Diamonds defence and Jahvan Davidson-Miller slotted the ball past Ben Heath. Diamonds pushed for a winner but were unable to find one with Nathan Hicks seeing a late effort saved. Corby Town’s automatic promotion hopes look to be fading away after they were edged out 2-1 at leaders Bromsgrove Sporting in Division One Central. The clash in the West Midlands attracted a huge crowd of 1,576 and they witnessed an even first half with chances at both ends before the hosts took the league just before the break. And it was a moment of magic from Jason Cowley as he flicked the ball up and volleyed home. There was a moment of confusion in the second half when the referee changed his mind having shown Camron McWilliams a red card but it was Bromsgrove who doubled their advantage with 10 minutes to go. Cowley was the provider this time as he set up John Pykett who smashed a shot into the corner. 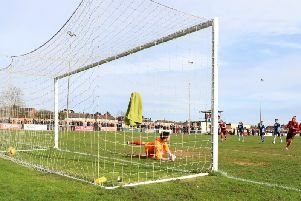 But the Steelmen kept going and they were given a lifeline when Joel Carta fired home after Delroy Gordon had flicked on Connor Kennedy’s long throw. And Kennedy went so close to securing a point in stoppage-time but saw his header from a Sam Warburton cross go narrowly wide. The defeat leaves the Steelmen nine points behind Bromsgrove with six games to play.